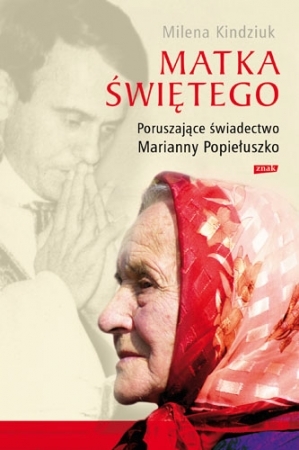 In just few hours Marianna Popieluszko will be present at the Mass for the Beatification of her son, father Jerzy Popieluszko (Yeh-zhee Poh-pye-woosh-koh), who was murdered over 25 years ago. She will carry the relics of her own son to the altar. Father Jerzy Popieluszko was a Solidarity chaplain and became a spiritual leader of those who were pursuing non-violent liberation of Poland from Communism. You can read father Jerzy's story in many places now, but I wanted to find more about his upbringing, childhood and the role of his parents in raising a present day saint and martyr. These are few nuggets that I found around the web, mostly from his mom's interviews. Father Jerzy's family lived in a small village Okopy in the far East of Poland, which is almost exactly the geographical center of Europe. His parents were peasants, lived simply and were very devout Catholics, as most of Poles in that region. When Marianna was pregnant with her son, she consecrated him to the glory of God and to Mary, and prayed that he will become a priest one day. She says that she doesn't know if her prayers were answered, or maybe someone else's prayerful petitions, but Jerzy, born on the Feast of the Cross, became a priest. "God gives grace, and if a person responds to it, and walks God's way, he will receive this grace." Since his childhood, Jerzy was fascinated by priesthood. He would walk 5km (3 miles) daily before the school to serve as an altar boy at the Holy Mass, and after school he went to church to pray Rosary. People thought that he was to spiritual. His mom was told by the elementary school principal that Jerzy spends to much time in church. "After seventh grade he wanted to join lower seminary in Niepokalanow (Maximilan Kolbe's City of the Immaculate), but I told him that he was to young then. When his friends finished high school and were celebrating the High Scholl Ball - he took the train to Warsaw for the seminary. I was happy when he became priest and I was praying constantly that he will be faithful to God, because this is the most important thing in life". She was teaching her children daily how to pray, kneeling before the small home altar with the figure of the Holy Mother. On Wednesdays - they prayed to Our Lady of Perpetual Help, on Fridays - to the Heart of Jesus, on Saturdays - to Black Madonna of Czestochowa. In May the whole family would recite Litany of the Blessed Virgin, in July - Litany to the Blood of Jesus, in October and throughout the rest of the year - the Rosary. During the storms she would lit a candle and pray. "His first seminary was in his home." "He was a nice, obedient child, but every child can be that way, if parents will keep them straight. All my children were the same. I did not punish them, there was no hitting, just very stern words: You have to do it! My kids were not into mischief. Whoever prays well, this person has no place for silliness in life." "Death of Jerzy for me is like a stone for my whole life. It is a great pain. This wound is opening over and over, for who can forget such a thing. But I do not judge no one, and I do not demand no one's death. God Himself will judge them one day. And the murderer's will have to bare their penance. But I ask Jesus to forgive them. I would be the most happy if they would come to God." John Paul II concluded meeting with Marianna: "Mother, you have given us a great son". And she responded, suprising even the pope: "Holy Father, I did not give him, but God has given him to the world through me. I gave him to the Church and I can't take him back." The Pope kissed her and hugged her. "To be faithful to God and, as much as one can, to serve others. "Once my legs were hurting me greatly and I should go for surgery. When I came to the grave of father Jerzy, the pain dissapeared. Now I can digg potatoes even for the whole week without a break" (she was over 80 years old when she said that). How does it feel to be a mother of a martyr? "You will know it only if you live through it. You have to receive the will of God. God chooses his martyrs. It is not possible to become one without His grace." What do you pray while you pray Rosary? "I pray for repentance of sinners, priestly vocations, and I thank for received graces." " God. If God is first, everything will take its rightful place. After you wake up, think about God right away. Then Rosary - one part. And then you start your day. Do you pray to father Jerzy? "I don't bother him, because people have more urgent needs, and he knows what I need and he is asking God for it." Do you feel his protection?
" I feel protection of Mary, Queen of Poland. Mother understands the best and in her hands is everything." "Let's pray so we can be free from fear and intimidation, but mostly free from the desire of revenge and retaliation"
Announcement of finding the body of father Popieluszko, where people gathered in the church and during the prayer Our Father, repeat three times "... and forgive us our trespasses as we forgive those who trespass against us". 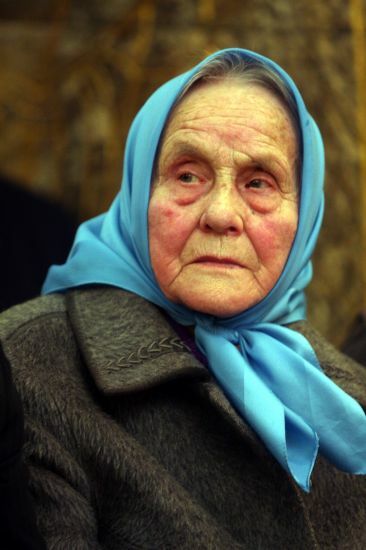 The next day father Jerzy's mom in the church where Popieluszko served turned to the people and said: "I forgive. I forgive." Marianna received St. Rita's International reward, which is given to people who forgive the murderers of their loved ones. She says she has forgiven the murderers of her son and she is praying for their conversion. She said that "they were fighting God, not my son", and that they were trying to fight the Church. Since then she can't recite other mysteries of Rosary than Sorrowful decades. Polish late President Lech Kaczynski awarded posthumously father Jerzy Popieluszko with an Order of the White Eagle which is the highest decoration given to Polish citizens for their merits. 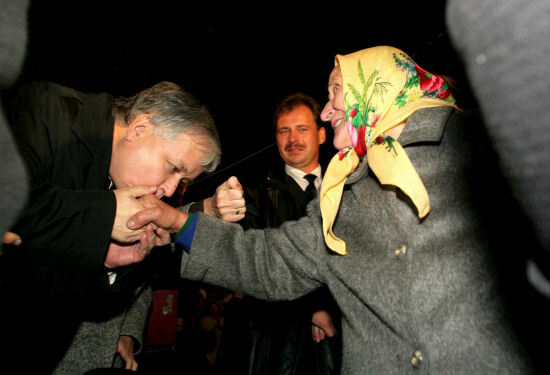 Here he is kissing Marianna's hand and expressing his gratitude.